Acute renal failure is a syndrome caused by many different causes, often in emergency revival. Called acute renal failure serum creatinine glomerular filtration by 50% or 50% reduction compared with the basic values ​​(baseline). I. - Causes and Pathophysiology. I usually put the cause of acute renal failure in three groups: renal kidney failure, kidney and after. * Acute renal failure before kidney. - The cause of decreased intravascular blood volume decrease renal blood flow, such as high fever, vomiting, diarrhea, lack of water due to all causes. Under normal physiological conditions, when the volume of traffic reduction, receptors feel pressure (baroreptors) in the carotid sinus and the heart are activated to increase activity of the sympathetic nervous system, renin-angiotensin system -aldosterone and information argininevasopressine (AVP-formerly known as antidiuretic hormone) resulting in vasoconstriction in areas not primarily to protect the main parts are the heart and brain. When renal blood flow reduction, self-regulation mechanisms (autoregulation) of the kidney with prostaglandins and prostacyclin dilates arteries to the microspheres (afferent arterioles). Meanwhile angiotensin II with removable micro arteritis (efferent arterioles). As a result, the pressure in the glomerulus is maintained by maintaining glomerular filtration. Mechanism to adjust the maximum effect when mean arterial blood pressure (mean arterial blood pressure) at about 80 mmHg, when the blood pressure is lowered below the self-adjusting mechanism is no longer effective so reduced glomerular filtration , cause renal kidney failure. The elderly and people with vascular diseases such as atherosclerosis, diabetes, sensitive to blood pressure status than ordinary people. Some drugs interfere with the operation of the self-adjusting mechanism in glomerular circulation as prostaglandin synthesis inhibitors (nonsteroidal anti-inflammatory drugs) or angiotensin-converting enzyme inhibitors and angiotensin II receptor inhibitors increase the risk of renal failure in whom renal blood flow decreased. * Acute renal failure in kidney., Many general disease damage in the kidney reduces glomerular filtration. The lesions in the renal tubules, glomeruli, interstitial tissue, and blood vessels of the kidney. Renal tubular damage is usually caused by ischemia (ischemia) or toxic to the kidneys. Ischemia may be due to hemorrhage, circuit failure, septic shock. Toxic to the kidneys may be chemicals, antibiotics such as aminoglycosides, acyclovir, dye or endogenous toxins such as hemoglobin and myoglobin. If renal blood flow continued to decrease renal tubular cells will be made necrosis acute renal failure before renal functional properties become acute kidney injury body called acute tubular necrosis. Acute tubular necrosis progresses through three stages: the initial phase, the maintenance phase and the recovery phase. After the first event causing damage to the kidneys, decreased glomerular filtration in one to two weeks and then gradually recover. Currently there is no way to make kidney faster recovery so to prevent acute tubular necrosis, such as intensive care, avoid toxic to the kidneys Acute glomerulonephritis usually more general expression such as fever, rash , joint pain, caused by streptococcus infection or pink erythematosus (lupus erythrematosus) or other systemic disease. Patients usually blood in the urine, in urine red head, and protein (protein). Interstitial inflammation can also cause acute kidney failure. Acute interstitial nephritis can be caused by allergies to medications, infections, infiltrates (infiltrative diseases). Symptoms of interstitial nephritis may include fever, rash, eosinophilic cells in the blood and urine .... Vascular disease including vascular small and large blood vessels. The small blood vessels usually expressed in hemolytic anemia from IC and renal disease caused by clogged or blocked small blood vessels. Macrovascular disease usually happens in older people due to renal artery stenosis or occlusion, thrombosis due to atrial fibrillation, or acute aortic dissection (acute dissection). * Acute renal failure after kidney. - Obstruction or pinched path urine also cause acute kidney failure. The possible causes large prostate tumors, or ... Need to find cause to remove almost mechanical recovery of renal function. Ultrasound is a means of easy-to-use, non-toxic help diagnose urinary retention due to mechanical causes. 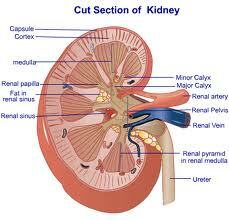 Asked medical history can help find the cause of acute renal failure, clinical signs of renal failure and the cause. A number of cases detected by daily monitoring in the critically ill in hospital. Need additional tests to assess the status and diagnostic discrimination. * Urine taken in the emergency room, before drug infusion or for differential diagnosis value. Normal urine in the renal kidney failure, on the other hand usually have brown seed head, epithelial cells and cylindrical epithelium in acute tubular necrosis. Density on 1020 urine in renal kidney failure, under 1,020 in renal tubular necrosis. Sodium less than 20 mEq / L in renal kidney failure, greater than 40 mEq / L in acute tubular necrosis. Classification rate of sodium excretion (Fractional Excretion of Sodium-FE Na) is a good indication to differentiate renal kidney failure and renal tubular necrosis, FE Na below 1% in renal kidney failure, more than 2% in the tanks acute tubular element. Urine osmolality of less than 450 mosmol / L in renal tubular necrosis, higher than 500 mosmol / L in renal failure before renal reflect the effect of anti-diuretic hormone (antidiuretic hormone-AVP) due to lack of volume on normal tubules. Low urine volume in normal renal kidney failure because the kidneys retain water and sodium, the opposite may be low or normal in acute tubular necrosis. Creatinine ratio in the urine and high blood above 40 in CKD before kidney because of water shortages intact renal tubular reabsorption of water, creatinine concentration in the urine, whereas this ratio is below 20 in Tanks tubular elements. It should be noted that the index of no value in patients with kidney disease earlier than the ability to concentrate urine which had been disorders. In this case can pass a test to monitor fluid responsiveness if you suspect the patient is dehydrated. * The new biomarkers. - Lipocalin neutral contact with gelatinase (Neutrophil gelatinase-associated lipocalin-NGAL) work protection and helped reproductive tubular cells strongly expressed after renal ischemia ( renal ischemia). A study based on 71 children treated with the artificial heart-lung (cardiopulmonary bypass) showed that the concentration of NGAL 50μg / L in urine 2 hours after treatment is an indication of kidney damage with a sensitivity of 100 %, specificity 98%. Other biomarkers were investigated cystatin C concentrations in hyet bar, Kidney injury molecule-1 (Kidney Injury molecule-1, KIM-1) and interleukin-18. Patients should be comprehensive examination and close monitoring of perception, respiratory, circulatory, birth marks, water entry, renal function and electrolytes. Need to find and treat the cause of acute renal failure. Need stable cardiovascular status, fluid and electrolyte balance to avoid the poison with care. Nutrition mainly based on carbohydrates, protein content in the diet should be balanced by at 0.6g/kg/ngay. Only use sodium bicarbonate when severe metabolic acidosis with pH below 7.2 or bicarbonate less than 10-15 mEq / L. Potassium less than 6 mEq / L can be controlled by adjusting the diet. When symptoms and electrolyte disorders not controlled by conservative therapy instead of kidney dialysis. Can filter peritoneal or artificial kidney as the case may be, depending on site conditions. Only instead of kidney dialysis include: full blood, electrolyte disorders, uncontrolled by medication, volume overload, BUN 100 mg / L, bleeding, pericarditis, encephalopathy. IV. - Some new information. * Dopamine. - Studies found that dopamine intravenous 2mcg/kg/phut not have the effect of preventing acute renal failure which could cause arrhythmia. * Diuretics effects on straps Henle. - Research shows no benefit diuretic that increases the mortality and slow recovery of renal function. * Sodium bicarbonate. - A study based on 119 patients showed that transmission bicarbonate solution before injecting the dye reduces the risk of renal failure due to contrast dye. The overall mortality rate of acute renal failure is 50%, no significant change in 30 years. Often patients do not die of acute renal failure but died of fundamental cause kidney failure. Mortality rates vary depending on the cause: 15% of obstetricians, 30% in the medical group, 60% in patients with renal impairment due to injury or after major surgery. Oliguria (urine under 400ml/ngay), creatinine on 3mg/dl when the hospital is bad directions. Higher mortality in the elderly and patients of many parts. Most patients recover enough kidney function to normal life, 50% of changes in renal function but without clinical manifestations and 5% recovery, it should continue to be treated with dialysis or a kidney transplant .